Editor’s note: This article is one of an occasional series profiling the 12 finalists for the Milwaukee Awards for Neighborhood Development Innovation (MANDIs). Pete’s Market is a finalist for the State Farm Building Blocks Award for a real estate project that advances the community. 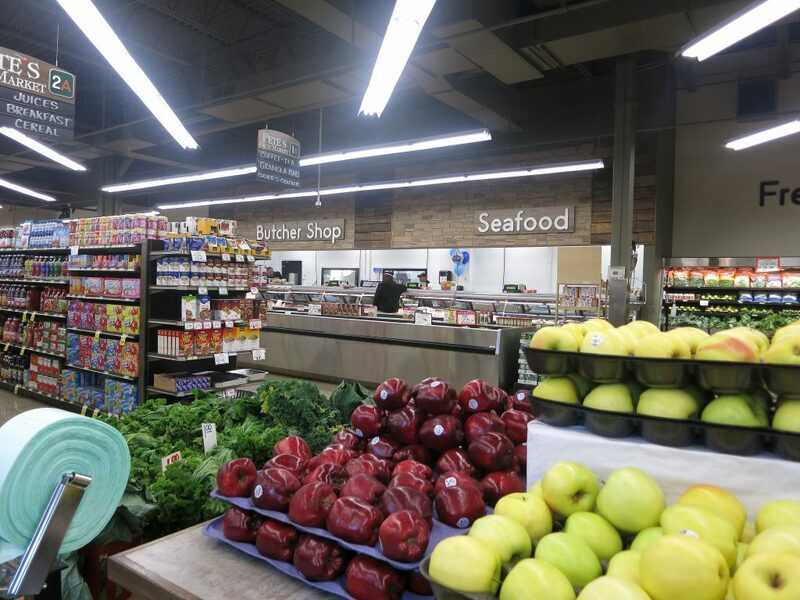 A property that once was once slated to be a Dollar Store today boasts a full-service grocery store selling fresh produce along with delicacies including black-tip shark from Florida, red snapper from Brazil, crab legs from Russia and bluegill from Canada. Pete’s Fruit Market at 2303 N. Martin Luther King Drive Jr. Dr. in the Bronzeville neighborhood celebrated its grand opening four months ago. The family-owned business was founded by Pete Tsitiridis in 1993 at 1400 S. Union St. The South Side store remains open. Theodore Tsitiridis, Pete’s son, now owns the business with his wife. He said he chose the vacant building on King Drive because the area was considered a food desert. Now, he believes Pete’s Fruit Market has changed things. “Quality food was needed in this part of town. We’re here now and we provide just about anything [residents] need,” he said. The development also is providing the community with jobs. Seventy-five percent of hires come from the surrounding neighborhood, Tsitiridis said. In addition, the construction company, JCP Construction, is minority owned and more than 50 percent of construction workers were minorities, according to developer Kalan Haywood, president of Haywood Group, LLC, which also is minority owned. “At our firm, it’s not just about building buildings, but building people,” Haywood said. Haywood noted that development, maintenance and operation of the store was designed to be grassroots and community-focused. 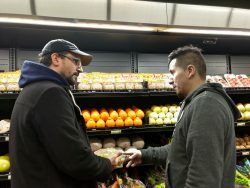 Organizations such as the Milwaukee Urban League, YWCA Southeast Wisconsin and Employ Milwaukee have helped the store identify potential employees, Pete’s Manager Vidal Colon said. The corner building, long vacant after a Walgreens drug store relocated about a mile to the north, was the center of controversy in 2013 when a Dollar Tree store tried to move in. Community opposition to the Dollar Tree was led by Ald. Milele A, Coggs, who represents District 6, where Pete’s is located. Coggs joined with the Milwaukee NAACP to demand that the neighborhood get a full-service grocery to improve the health of the community. Haywood was instrumental in convincing Pete’s to move to the Bronzeville location. 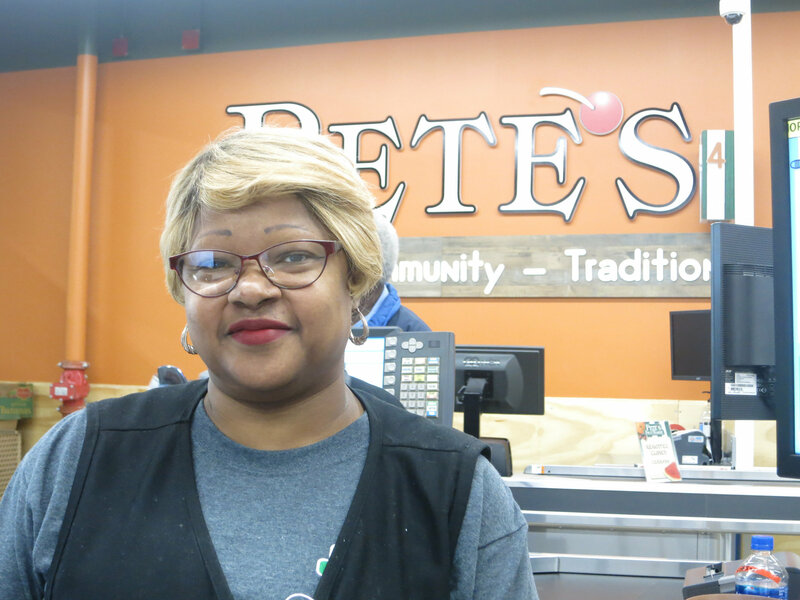 Vevlin Stewart, a cashier at Pete’s, said having access to a full-service grocery store has prompted her to change her eating habits. “I love working here. I love working for the people I work for. I eat more fruits and vegetables [and] I’ve been cooking more,” she said, proudly displaying a photo on her phone of pork chops and sautéed portobello mushrooms. “I live a block and a half [away]. I walk here. I have the easiest time getting to work,” she said. Clara Fleming, a Milwaukee resident since 1985, said the diversity of healthy foods at Pete’s immediately caught her attention. “You want to be able to have more than one type of apple,” she said. Fleming pointed out that Pete’s is in a convenient location. “Many people in this area don’t necessarily drive [but] it’s right at the intersection of two bus stops,” she said. “I like the size, I like the lighting and I like the location,” she added. Pete’s was built with energy-efficient lights such as LEDs, which use 25-80 percent less energy compared to traditional incandescent bulbs. Haywood also noted that Pete’s was constructed using materials low in volatile organic compounds (VOCs), which are hazardous to health. Tsitiridis’ wife and co-owner, Anne Marie Tsitiridis, said that some of Pete’s bestsellers are baskets of fruits and vegetables for $1, $2 and $3. The market offers free samples of produce. “As soon as they try it, they buy it,” Tsitiridis said. In the back-right corner, seafood imported from national and international locations is displayed in a glass case. Brown shrimp from Texas, pink shrimp from Argentina and jumbo freshwater prawns from Vietnam were just a few of the choices. Butcher Rob Gamble pointed out the full line of smoked meats, in addition to fresh chicken, beef and pork. “We never use frozen,” he added. Gamble also noted that more and more customers are leaning towards seafood or eating vegan. The seafood sausage sells out every time it hits the shelves, he said. Erma Hannah, 76, was on her way to pick up her granddaughter when she stopped at Pete’s. “I like shopping here because they have most everything I want,” she said, adding a box of Splenda to her cart. Tsitiridis pointed out that customers such as chef Greg Johnson, who works for On the Bayou on N. King Dr., buy produce from Pete’s and use it to prepare food. The local Jamaican Caribbean restaurant is another Pete’s client and Pete’s recently offered to share its parking lot with another Jamaican restaurant. Robert Sandoval, an employee who has worked at Pete’s for 18 years, said that when he started at the South Side location, Pete’s was selling produce under tarps. Haywood said that he hopes that Pete’s Fruit Market will become a prototype for socially responsible neighborhood development in other areas. I’m glad that Pete’s is there and our family goes weekly but the area is hardly a food “desert” with a grocery store 1 mile to the east and another 1 mile to the north. And less than a mile to the south (Fresh Thyme). Good luck to Petes, but they have a ton of competition.